Once upon a time, in his home country Australia, Gregory David Roberts was known as a gentleman bandit. Roberts, who had got into drugs after his marriage failed and his wife took away their daughter, started robbing banks with a toy pistol. He wanted money to support his drug habit. The Australian authorities were not amused with the misadventures of Roberts, a highly regarded academic heading for a bright future as a philosopher and a radical who fought the establishment. When he received over 10 years of maximum imprisonment, he began plotting his escape from Day 1. He arrived in India under a false passport in 1982 after having served about five years of his prison term. Hoping to lead an anonymous life in India, he chose Mumbai where he would soon acquire proficient Marathi and set up a free clinic for slum dwellers. But within three years the local underworld recruited him to smuggle passports and foreign currency. In the middle of his illegal activities, he worked as an extra in dozens of Hindi films, then went to Germany and started a band. But he could not put behind his criminal activities. He was extradited to Australia after serving a year in a German prison. 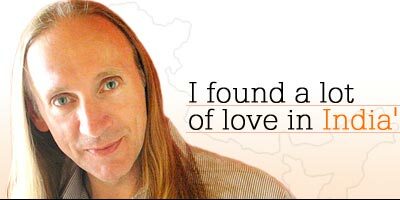 Back home, as he learned to heal himself from the scars of his addictions and misadventures, he began writing Shantaram, a fictionalised account of his high-risk life. The acclaimed book, which turned out to be a nearly 1,000-page opus, will be made into a $60 million to $70 million movie next year. Gregory David Roberts spoke to rediff.com Senior Editor Arthur J Pais from his home in Australia. Johnny Depp is playing you in a movie that will be a big Hollywood production. I did not think of a movie when I began working on the book. The book was part of my healing process. I wanted to share with readers across the world how my life had been turned inside out. Of course, I am curious and eager to see how the film will turn out. It will help my book reach many more people. It has been stated that you acted in several Bollywood films. What did you do in them? (Laughs) I played bit roles. A gora in a party scene or in the villain's den. If you see old Hindi films, the ones made in the 1980s, look at them hard. You may find me in a scene or two. But I learned to do something more lucrative than doing bit roles. I noticed that producers were constantly looking for gora characters. But many Indian studio hands found it difficult to go to a five star hotel or a beach and convince the goras to do a bit of a day's work. In my case, it was different as I was a gora myself. I discovered I was good at recruiting. I took a cut from newly recruited artists and producers also paid me. (Laughs) Appalling. I did only bit parts and even in those I was terrible. Would you dare do a part in Shantaram? (Laughs more) I don't think I should. I am involved in writing the script, though. You talk of Mumbai being a city you love a lot, and you feel it has not been given its due. Many bad things happened to me in Mumbai. I was tortured in prison under trumped up charges. But I never lost my love for the city. It is a city of great vitality and melting cultures. I never forgot the people who helped me -- and how many millions there work hard to lead a meaningful life. Why is that it took you a long time to go back? When I was captured in Frankfurt in 1990 and imprisoned in a prison for terrorists, I began to change. I was not going to be an outclass anymore. I wanted to go back to Australia or India and start a new life. I was extradited to Australia, where I was placed in solitary confinement for two years, and then in another prison for having run away from the country in 1980. I was released in 1997. By then I had been nearly six years into writing Shantaram. My parole ended two years ago, and I had to continue writing and save money to help my parents. Now that the book has been published I am ready to go to Mumbai. What reception do you expect? I don't know. But I have many friends in Mumbai. The mafia I knew in the 1980s are not around. Their relatives and sons are continuing the business. The older generation did many bad things but even then they had a code of conduct. The young ones want to do anything to be rich overnight. Did they know you were writing about them in Shantaram? sent a friend to meet with some of them before I began writing. They put one condition, which I perfectly understand. They wanted the identities of the mafia men well hidden. They sent word that I should not make them look like idiots because reporters and writers made them look stupid and bad. What is it that you love most about Mumbai? I fell into Mumbai as a wounded man might fall into the arms of a stranger -- a woman who cares for him and heals him for no other reason than that she should -- so I too fell in the arms of the city and got healed by her. But you carried on working with the underworld in Mumbai. Yes, but the healing process had started, though it would take a few more years and many misadventures to change my life. The people in a village near Mumbai gave me the name Shantaram. At that time I did not understand the full implications of their act. In their wisdom, they knew I was not worthy of the name. But they knew -- or at least they hoped -- that one day I would be worthy of that name, and I will find inner peace. You ran an illegal clinic in the slums in Mumbai. Do you plan to do something legally to help some of the slum dwellers? I have set up a trust fund to raise money for a mobile clinic for the slum dwellers. Work on that will occupy quite a bit of my time in Mumbai. When you look back at the last two decades of your life, what is the most precious discovery you have made? How love can help one change considerably. I found a lot of love in India. I found a lot of love in my mother's faith that one day I would turn away from the destructive path. How did your mother's love help you fight your inner demons? It was a vision I had in Germany when I was planning another escape from prison that changed me radically. With that vision came the feeling my mother was praying for me. What was the vision like? I could see a police officer in Australia informing my mother that I had escaped again. Her face had this horrible expression that was filled with pain. I opened my eyes as I realised what it cost her to keep hoping I would be truly free one day. As I opened my eyes, I knew what I had to do. I knew I had to complete my prison term in Australia and start doing what I wanted to do over two decades. Write novels, work on philosophical books, and write poetry. Give up drugs, including alcohol. It has been nearly 15 years (since the German police extradited him to Australia) that I have had a cigarette, taken a drink or used any drug. The forgiving process has kept me busy. What were some things you have forgiven? I was tortured in prisons in India and Australia. I learned to forgive the tormentors. I was given a far stiff sentence than I deserved for robbing banks in Australia. It had to do with me being a radical student leader and anti-war protester. In prison, a warden destroyed nearly 300 pages of the first draft of Shantaram. I had to start writing it all over again. Years later when he asked for forgiveness, I thanked him for making the book better. Do people ask you whether you have a mantra for overcoming addictions and a life of crime? (Sighs) They do, but I have no formula. I tell them I got over my past life because of my mother's love, my daughter's love and the support of friends and well-wishers. They deserve the credit, not me. And India. The healing process unconsciously started long, long ago in India. But it took me a long time to realise it. The villagers who gave me the name Shantaram should know I am undergoing a transformation and slowly achieving more and more peace.